After some abortive early attempts and a trip to purchase new batteries we finally had everything ready and switched the device on! Immediately, numerous issues presented themselves. Switching on the Supervision handheld with the TV-Link cart fully plugged in brings up a neat visual of a weird unnamed android, a picture of the TV Link itself and the words 'TV-Link Playing' on the Supervision's screen. The practical upshot being that you can now use the Supervision as a controller to guide what is happening on the screen...and what is happening on the screen? Well, not what is supposed to be happening that's for sure. Left: The funky android struts his stuff and your handheld is now a bulkier than ever controller. Interestingly, the same android design is used on the box art for Hartung's Game Master console! ​Right: Popo Team is looking a lot darker these days and what precisely is the 'UpupivisvisN'? 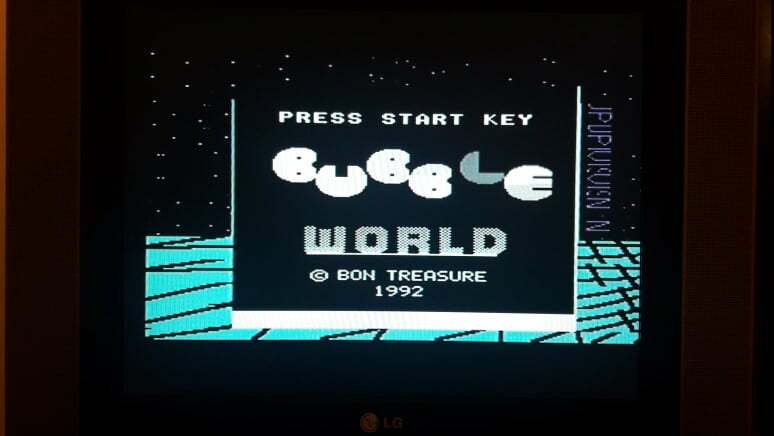 As with the Super Game Boy, The TV Link games play within a self contained border. It's fairly 90's in look and contains a metallic looking/Tron style grid running along the floor along with a starry background. 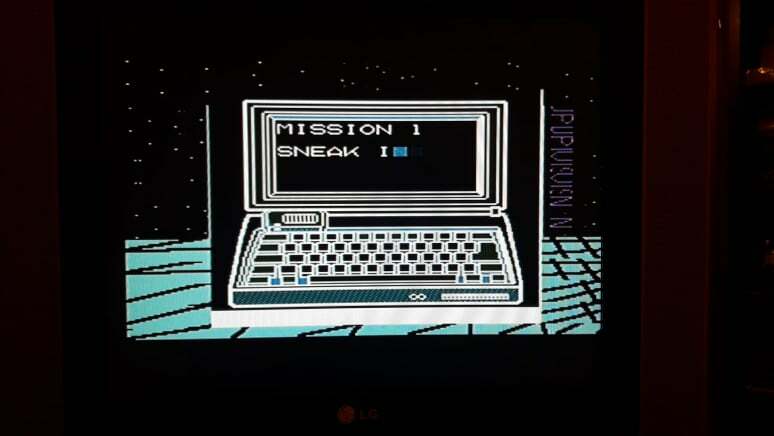 The word 'Supervision' is displayed vertically down the right hand side. At least, the word 'Supervision' is supposed to be displayed there. For some reason, our TV-Link displays the text 'UpupivisvisN' and no mount of fiddling with wires and blowing into ports was able to produce anything else. It's been pointed out that perhaps fading capacitors or other technical gubbins may be to blame for this. Similarly, the top of the screen border is also missing on our display. While this is disappointing, we did get the unit significantly cheaper than those that occasionally pop up on ebay and fortunately it doesn't affect the games in any way. Ah, the games. We tried our entire (albeit incomplete) library of games and found that all worked with the TV-Link with the exception of a particularly grubby soccer game that crashed every time. Compatibility does, therefore, seem to be high. Now let's address the elephant in the room. 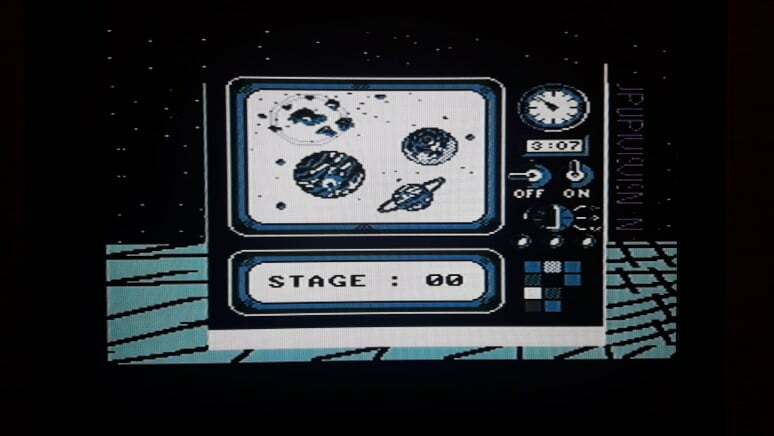 As you have probably already seen from the screenshots, the TV link does a couple of very odd things when converting these games for display on your television set. 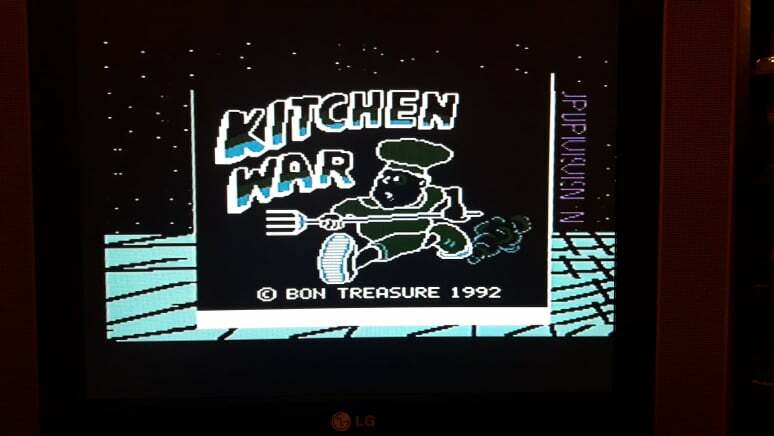 Here's the Game 'Kitchen War', on the left you can see how it should be displayed on the Supervision. On the left you'll see what the TV-Link does to it in terms of both an oddly inverted colour scheme and an incorrect aspect ratio. Note how the power-up is appearing on a part of the screen you normally wouldn't see. This also occurs in Tennis Pro '92 where a lonesome ball can be seen bouncing itself to your left during serves, just slightly but not quite off screen. Brrr. For some reason the aspect ratio of the Supervision has been altered for the TV-Link display. 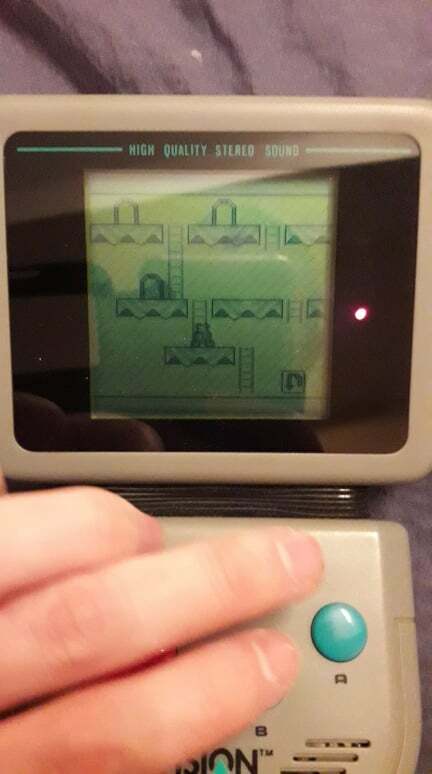 The Supervision is actually something of an oddity as it has a perfectly square screen as opposed to the more common ratio found on the Game Boy and others of the time. On the TV Link, however, that image is clearly stretched to an image that is much wider than is tall. This leads to squished sprites, the occasional off-screen artifact appearing and a rather different feel and look to the games. The second most noticeable thing is the colour scheme. Let's talk about that for a moment. 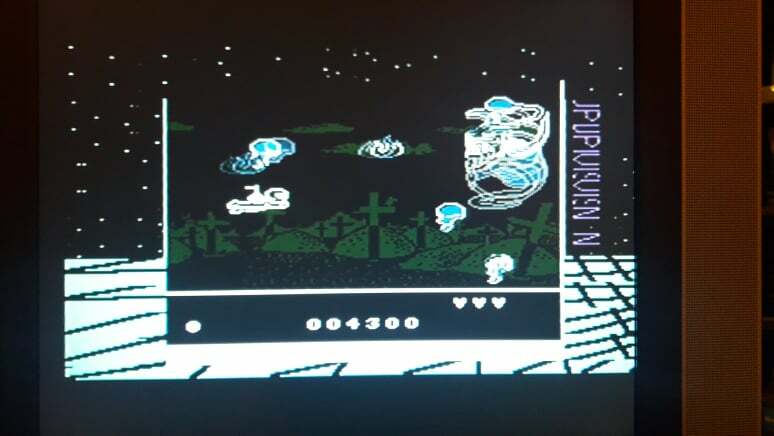 Rather than the warm shades displayed on the boxes promotional artwork, the four shades of grey of the original handheld have been translated here into black, white, pale blue and dark green. 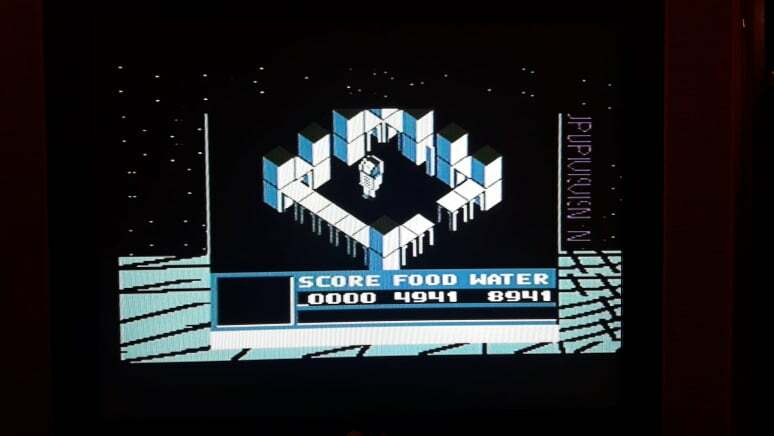 The effect isn't bad (akin to something like a ZX Spectrum look) but perhaps the oddest choice is to invert the lightest and darkest shades on the Supervision with the effect that what was light on the Supervision is now dark on the TV-Link and vice versa. There are a couple of reasons as to why this decision might have been taken. Firstly a dark background is certainly easier on the eye than a brightly lit one. Indeed for the system's plethora of space shooters it feels entirely natural. it fits right in with the moody halls of Chimera (pictured about) and isn't too out of place in Crystball. 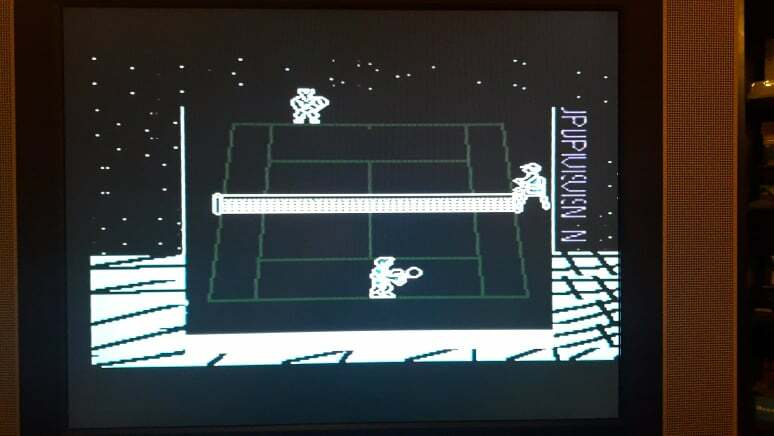 However it looks simply ridiculous when rendering snowscapes or tennis courts in this shade, leaving ghostly shimmering outlines of player sprites to navigate them. 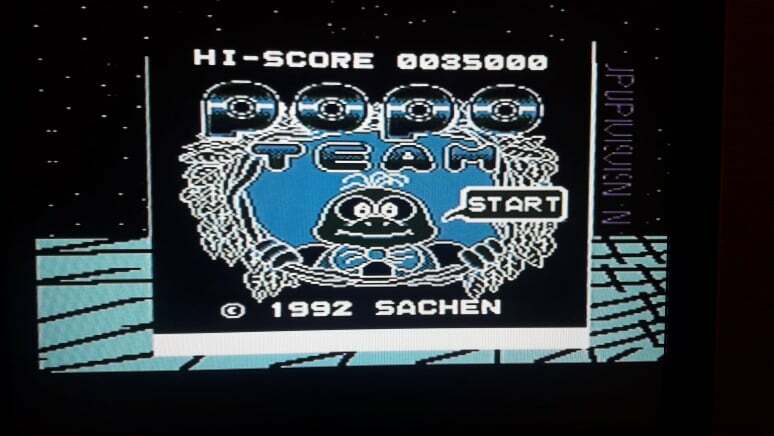 The option to change the colour palette, even with a limited selection, would have made all the difference here and it's easy to see why the Super Game Boy added this feature. While the TV Link is never gaudy like the Gameking III's random colour clashing 'upgrade', the reversal of the standard shades of grey really does render everything in the Supervision's world as existing in some ethereal, permanent state of night. ...but is it easier to see what's going on? Let's be honest, the screen on the Supervision's handheld initially looks lovely, in fact everytime you turn it on you are tempted to think you have misjudged it. 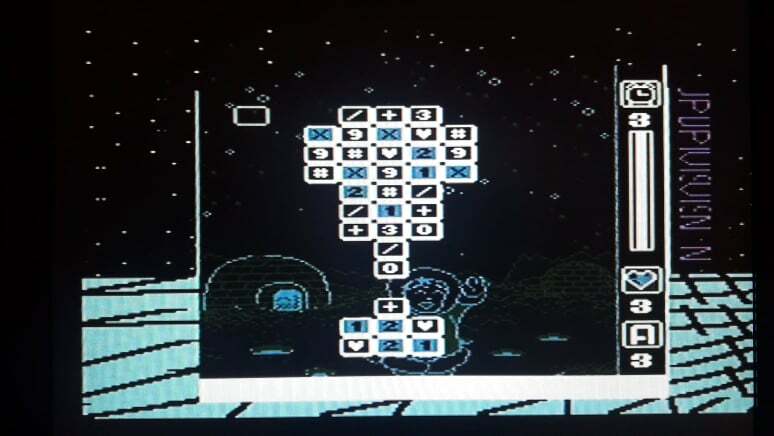 Then things start moving and everything turns into a blurry, ghosting mess (single screen games with slow moving sprites usually being the exception). With the transition to television there are some improvement. The enemies of platformers like Kitchen War are now rendered clear to see, rather than taking on the effect of the Predator in full camouflage mode as they do on the handheld. The halls of Chimera are now crisp and easy to navigate, rather than blurry and indistinct as they were on the handheld and the enemies and bullets of numerous space shooters are now a lot easy to pick out, improving playability in games like Untouchable. It's not all great though. 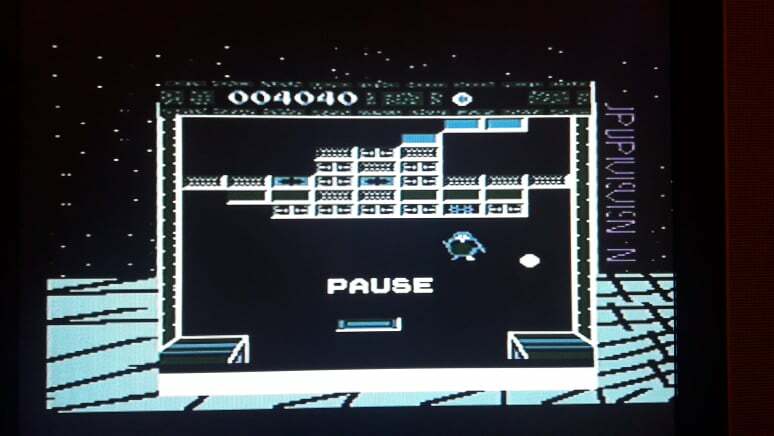 Sadly the ghostly shimmer of the ball in Crystball is still present on the big screen, indicating that perhaps this was a problem with the hardware being underpowered rather than the quality of the screen. The horrible jerky animation of games like Hero Hawk or Delta Hero is exposed worse than ever on the TV screen. It's akin to watching an old B-Movie that just about got away with its cheap effects on the soft screen blur of standard definition but which looks simply awful when shown in HD. ​We had heard that the sound also gets screwed up in the transition to TV, with some game running at a higher pitch or sounding unusually shrill. Honestly, it's hard to say. The Supervision has such legendarily awful sound effects and music that nothing memorable enough to be noticeable springs to mind. It sounds like a Supervision coming out of a mono speaker, which never sounded good in the first place. You would think that controls would be pretty much the same, regardless of whether or not you played the Handheld or the TV Link. Technically this is true. It's not actually necessary for the Supervision to sit docked in the TV Link itself but the wires and their placement don't leave much room for holding it in your hands. While it's feasable to play it docked in the method shown on the box, most adult gamers won't fancy lying sprawled on their carpet just inches away from the TV. Picking up the whole thing is the alternative and while it's not impossible, it's akin to holding something the size (if not weight) of a breeze-block. Small handed people can reasonably expect cramp to set in fairly quickly! So, with all of that being said, do we recommend buying the TV Link? Click the button below to be taken to our final verdict.